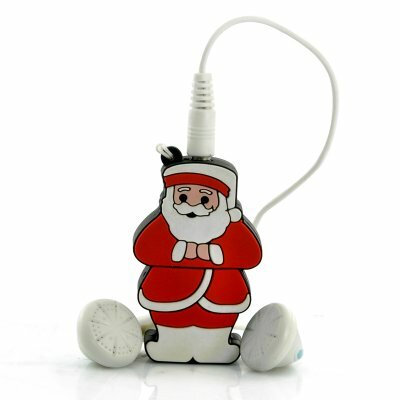 Successfully Added Fun Santa MP3 Player - Holiday Necklace/Pocket MP3 to your Shopping Cart. Fun Santa holiday necklace style mini MP3 player with 1GB of built in flash memory. Ho ho ho, what better way to show off your holiday spirit than a Santa Claus that pumps out digital music? This 1GB MP3 player has simple controls built into the back of the MP3 player and rocks an internal rechargeable li-ion battery for hours of music. The Santa MP3 Player is small enough to be worn as a decorative necklace and can easily slip in your pocket. Great as a personal MP3 player or as a gift for people who enjoy Christmas collectibles! The Fun Santa MP3 Player is only available from your source for wholesale Christmas gadgets direct from China, Chinavasion. Dimension is for the main item of this boxed product, to help you compare product sizes before buying: please do not base your shipping calculations on this price - shipping prices depend on your cart contents, shipping destination, and shipping method: please use the checkout to select options and preview shipping price for your total order.